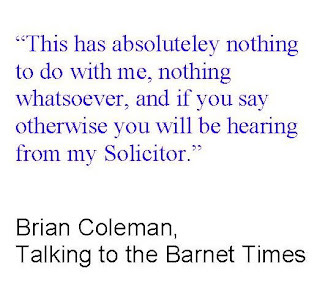 Not The Barnet Times: Brian Coleman has GOT to go! Yesterday, Not The Barnet Times broke the story that Mike Freer was wasting £10,000 of taxpayers money providing legal services for a councillor being investigated by the Standards Committee. The real scandal of this story was that the council’s insurers were willing to provide a lawyer at no cost to the taxpayer, but the councillor in question wanted one of the biggest London firms to act for him instead. Our friends at The Barnet Times followed this up with an article of their own in which they named the councillor under investigation as Brian Coleman. Cue Coleman on the phone giving the journalist an ear bashing, denying that he was the councillor in question and threatening legal action. The only problem for Barnet’s Most Pompous Councillor is that his leader, Mike Freer, had already confirmed that Coleman was indeed the councillor under investigation. 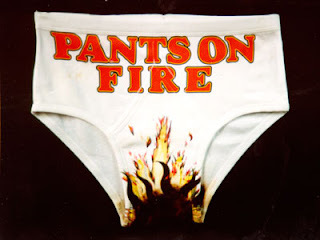 Leaving aside the issue of the investigation itself, Brian Coleman, who hopes to be installed as Mayor of Barnet next week, has told a deliberate untruth to a local newspaper in order to throw them off the scent of a story which could have portrayed him in a bad light. Regular readers of this blog will know that I have in the past defended Coleman’s right to make an idiot of himself, but there are certain lines which cannot be crossed. At a time when the integrity of politicians is under scrutiny as never before, a councillor who says something to the press knowing it to be untrue, forfeits his right to remain in office. David Cameron gets it. Brian Coleman clearly doesn’t. In the words of another Barnet resident, Coleman has GOT to go! I've just written my own blogpost about the mayoral swearing in, in the context of the warden cuts. I don't believe that Coleman is capable of this. I really felt when he was chosen as the next mayor that it was like Freer's administration putting two fingers up to the opposition. Trouble is, they ended up putting two fingers up to the whole population of Barnet. Thank you so much for the link too. Thank you. I trust that my award will be sent round in a taxi! This award has absolutely nothing to do with you, nothing whatsoever, and if you say otherwise you will be hearing from my solicitor.